Northborough-Southborough U11 Tomahawks play Waltham during Halftime. 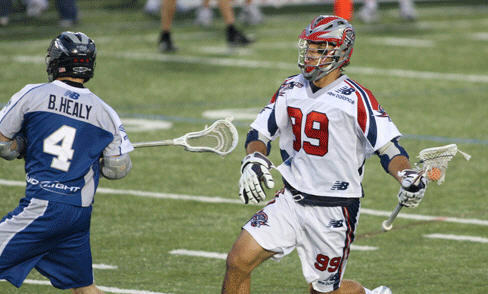 BOSTON, MA - Thursday, June 19, 2008 – Midfielder Paul Rabil (Johns Hopkins ’08) netted four goals and one assist to earn Bud Light MVP honors and goalie Kip Turner (Virginia ’07) made 20 saves as the Boston Cannons of Major League Lacrosse (MLL) defeated the Washington Bayhawks by a score of 14-12, in front of 8,279 fans at Harvard Stadium on Thursday night. In front of those same 8,279 fans on a spectacular summer night, which included 321 parents and players from our NSYLA program, our combined U11 team played a six minute game at halftime during this nationally televised ESPN game. The coaches executed a precision game, getting 40 players game time. It truly is a special event to play in Harvard Stadium, and this was the fifth straight year that the Northborough-Southborough Night has drawn enormous support for our hometown Cannons. 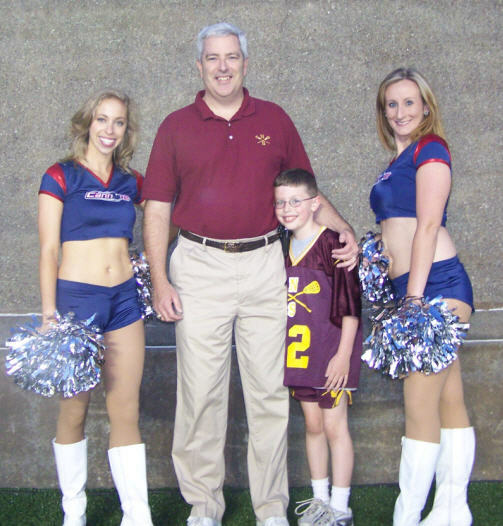 The Cannons also recognized Coach Flynn as the Honorary Coach of the Game that evening. “The success of the NSYLA program is due entirely to the terrific volunteers we get each and every year. No other youth program has as many coaches and volunteers as we do, and all of the parents abide by the principles of the Positive Coaching Alliance, which gives youth sports back to the kids as a way to have fun and stay fit” Flynn said. Rabil opened the contest with the first two goals of the game, at 1:17 and 2:40, to give the Cannons a 2-0 lead and put on a show for the home town fans in his first game at Harvard Stadium since being selected by the Cannons first overall in the MLL Collegiate Draft on May 28. The Bayhawks cut the early lead in half with a goal, but from there the Cannons took over and dominated the rest of quarter. Attackman Matt Alrich (Delaware ’04) gave the Cannons a 3-1 lead with his first goal of the game, assisted by attackman Sean Morris (UMass ’06) at 6:35, attackman John Christmas (Virginia ’05) collected a goal at 10:51 and midfielder Kevin Dougherty (Syracuse ’04) put the Cannons ahead by a score of 5-1 at 11:40. Midfielder Matt Poskay (Virginia ’06) closed the first quarter with his first tally of the game to take a 7-1 lead for the Cannons at 12:43. Rabil assisted on the goal by Poskay. The second quarter began much like the first, with Rabil collecting the first marker of the frame, to give the Cannons an 8-1 lead at 46 seconds. Attackman Mike Powell (Syracuse ’04), in his first game since back from an injury he suffered against the Rochester Rattlers on May 23, earned the helper on Rabil’s third goal of the contest. 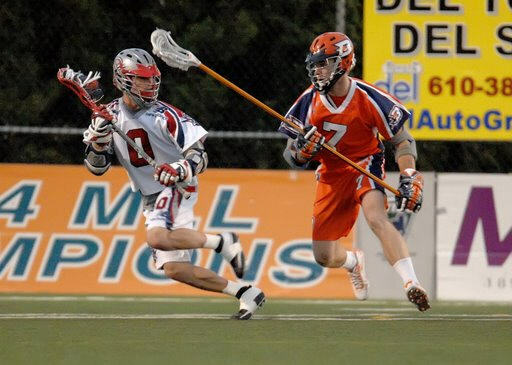 After a man-up two-point goal from the Bayhawks to cut the Cannons’ advantage to 7-3, the Cannons answered back with a goal by defenseman Ray Megill (Maryland ’07) at 4:14. Defenseman Colin Hulme (Colgate ’07) assisted on Megill’s first goal of the season. The Bayhawks posted two quick goals to close the Cannons lead to 8-5, but Alrich posted his second goal of the game, assisted by Poskay, at 6:49 to increase the gap once more. After another quick tally from the Bayhawks, Rabil closed the segment with his fourth goal of the game at 10:14, giving the Cannons a 10-6 advantage heading into halftime. The defensive units for both teams were strong in the third quarter, as only three goals were scored during the 15-minute frame. The Cannons opened their lead up to 11-6 with a goal from Morris at 51 seconds, and Poskay added his second tally of the game to give the home team a 12-6 advantage at 1:28. Morris earned his second assist of the game on Poskay’s goal. The only other goal of the quarter was scored on the power play by the Bayhawks at 2:23, to cut the Cannons lead to 12-7. After 13 minutes and 14 seconds without a goal for either team, the Bayhawks broke the scoring drought with two markers at the start of the final quarter to shrink their deficit to 12-9. However, the Cannons responded with two goals of their own to increase their lead to 14-9, both scored on the power play, from Poskay and Alrich, respectively. Poskay’s tally, his third of the game, came at 3:42, while Alrich netted his third goal of the contest at 4:53. Powell earned his second assist of the game on the goal by Alrich. The Bayhawks attempted to rally in the final minutes of the contest, but ultimately it wasn’t enough as the Cannons posted a 14-12 victory for the home crowd. Turner earned the win for the Cannons, his third of the season, with 20 saves on the 31 shots he faced in the contest. Bayhawks goalie Chris Garrity (Penn State ’04) took the loss with 14 saves on the 28 shots he faced. 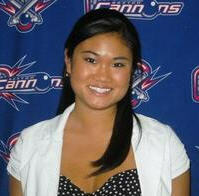 Our thanks go to the Cannons for the terrific time they provide, and especially to Kathleen Bossidy, the Cannons Ticket Manager, who handles all of the arrangements for our "Night at the Cannons" each year. Our U11 team will play an 6 minute game on the field during halftime, in front of at least 9,000 fans. All U11 players who come to this event will play during this game. Last year we got all 34 players who suited up into the game. Call or email Stephanie Nardone for information. There will be a special surprise for the players that evening also! We have arranged for Mikey Powell and Kip Turner to meet and greet our players before the game! 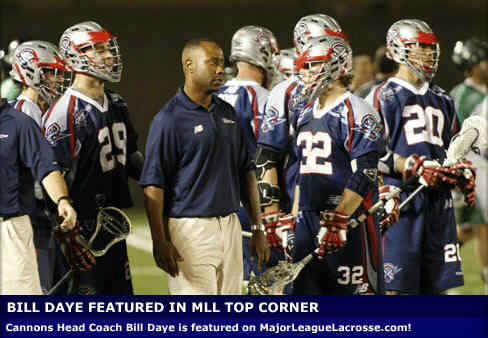 (Mikey Powell is the Tom Brady of Lacrosse for those not familiar with the sport. General Information on Cannons Youth Games: The Pre-Game Youth Games consist of two 25 minute halves, running time with a 5 minute half time. Halftime Youth Game are approximately 8 minutes in length and are played in front of all the fans each night. Typically, U-15 and U-13 teams play in the Pre-Games and U-11 and U-9 teams play in a Halftime Games but that is not always the case. We require a 100 ticket minimum purchase per team in order to secure your team’s spot in a game. Each team is required to provide a game ball and referee; the Cannons will provide water for both teams. Games are available on a first come, first serve basis so the above list of available games could change at any time. To lock down a spot for your team please contact me ASAP at 617-746-9933 ext. 2612. I look forward to hearing from you.